The Syrian Arab Armed Forces (SAAF) are fighting ISIS in eastern Syria. Australia is planning to bomb ISIS targets in eastern Syria. But Australia will not be involved in the broader conflict in Syria involving the Assad regime. If this doesn't appear to make sense to you it's because the concept doesn't stand up to scrutiny. But according to the Defence Minister Kevin Andrews last week, Australia will somehow be able to bomb ISIS targets in eastern Syria without becoming involved in the broader Syrian conflict. The Minister somehow believes this because the RAAF will not be operating over Assad-controlled western Syria or Damascus, and that Australia can somehow magically target those ISIS elements who exclusively operate in or support the conduct of operations in Iraq. The Foreign Minister and the rest of the Government trot out the line that ISIS doesn't recognise borders and that attacking the group in Syria is the same as attacking them in Iraq. This is of course nonsense as ISIS has the ability to redeploy forces where it perceives the operational need to be. ISIS elements in Syria operate against the Syrian regime and may also support fighting in Iraq. The Government would somehow have us believe that the Syrian military is absent in eastern Syria. But eastern Syria is still a battleground for the regime, and there are several Syrian regular, Republican Guard and Special Forces brigades operating there. The main stronghold of the Syrian Army is Deir az-Zour, a tactically-significant city between Raqqa and the Iraqi border. Deir az-Zur is heavily contested between ISIS and regime forces, with the regime holding several positions including the military airport. This recent report shows how intense the fighting can be. 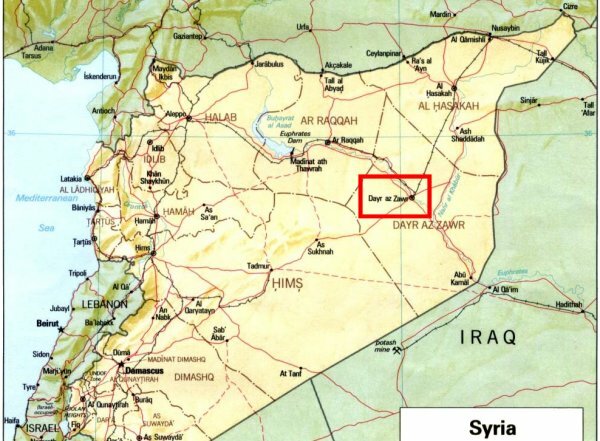 The Syrian government also controls (along with Kurds) the northeastern provincial capital of Hassakeh which ISIS has tried to capture without success. So targeting ISIS inside Syria may not actually impact ISIS's Iraq operations – the ISIS militants, equipment, HQ, or logistical facilities which the RAAF might target in Syria may actually have been directed against Hassakeh or Deir az-Zur rather than Iraq. And while the SAAF doesn't appear capable of mounting offensive operations in these areas, RAAF strikes could potentially aid SAAF defensive operations. In other words the RAAF could be strengthening the hand of the SAAF in eastern Syria by bombing ISIS there. This is the law of unintended (or in the Government's case, unstated) consequences. Now, if the proposal the Government is 'considering' is simply about allowing RAAF aircraft to engage ISIS convoys after they cross back into Syria from Iraq, or to engage ISIS weapons firing indirectly into Iraq from Syria, then RAAF targets could arguably be quarantined from the broader Syrian conflict. If the Government has another method by which it can ensure that only Iraq-bound ISIS fighters or equipment will be targeted, then they disclose this publicly. Conversely, if the Government doesn't have the ability or intention to do this, then it should acknowledge that RAAF assets could, through their actions, be relieving some of the pressure on besieged Assad forces in eastern Syria. They could mount the argument that the threat from ISIS to Australian interests is greater than that from the SAAF in Deir az-Zour or Hassakeh, and they will therefore target ISIS regardless. But what they shouldn't do is create the impression that an air campaign in Syria can be sanitised to such an extent that the RAAF will only be targeting ISIS fighters who will only operate in Iraq, and that the strikes will not have an impact on the broader conflict in Syria. The SAAF remain active in eastern Syria and are under attack from the very group that the Australian Government proposes we target. The Government needs to articulate very clearly how the RAAF will be able to target ISIS in eastern Syria, while avoiding involvement in the broader Syrian conflict. It's the least that the public deserves.